Lee Loader • View topic - You Ever Just Not Have Fun On Range Day? You Ever Just Not Have Fun On Range Day? Re: You Ever Just Not Have Fun On Range Day? I've only had mine 6 years, but it's simple to set up and use (if I'm careful to get it properly aligned both vertical and horizontal). I just use log sheets and write down each velocity, then dump them and the bullet info into an excel spread sheet later. It's slow, relatively speaking, but mostly hassle free and reliable. Was the check seated on a 4500 (or similar) or on a push-through? I planned on using the cord and app to record on my phone but since I haven't taken it out since it's a moot point. I actually use the F1 JD, it has the toughest job of them all. I set it in front of the target at 100 yards when I'm calculating the actual BC of a bullet. Haven't hit it yet. The Caldwell Target Cam makes it easy to read. GasGuzzler wrote: When it rains it pours. Yes, it does. I took it as a sign from the range gods. I bought the Caldwell Ballistic Precision G2. GasGuzzler wrote: Was the check seated on a 4500 (or similar) or on a push-through? The gas checks are seated with both. Immediately after casting, I run them through the Lee push through sizer as my 6/4 linotype to wheel weight alloy gets tough quick. When I'm ready to use them, they get lubed on the 4500 with 2500+. Just one of those things. Sometimes you lose one. GasGuzzler wrote: I planned on using the cord and app to record on my phone but since I haven't taken it out since it's a moot point. Yeah, nowadays it is the way to go. The Labradar took a number of years to fill that promise but the app doesn't have the features that the Caldwell app does. The G2 eliminates wires and replaces the 9V battery with a rechargeable Lithium-Ion battery like that used on the Target cameras. The shooting range is 40 kilometers from my place. i went out one day with 4 bolt action rifles to test some loads i had made up over the winter. I keep all my bolts in a metal locked tool box that is stored away from my gun cabinets. i have two identical such boxes. Need I go on? I used a basic chrony for years. Other than it twisting in the wind which ended up with the two skyscreen supports being shot in half it worked great. I bought a Caldwell with the cable and record on my phone or tablet. I still write down each shot manually. I am pretty careful about setting up as once saw a fellow club member put a hole right through chrony when he changed from a lead sled to a bag. The look on his face was said it all. I broke the cycle! I had a very good range day yesterday morning, three hours worth. The Labradar stayed on the shelf, and the new Caldwell Chrony G2 took care of business. I put approximately 100 shots across it, and it did not miss one, and it did not fail to Bluetooth a single shot's data to my phone. With my location setup, it captured both temperature and pressure for each string. This is a big chronograph; I think that is a good thing. 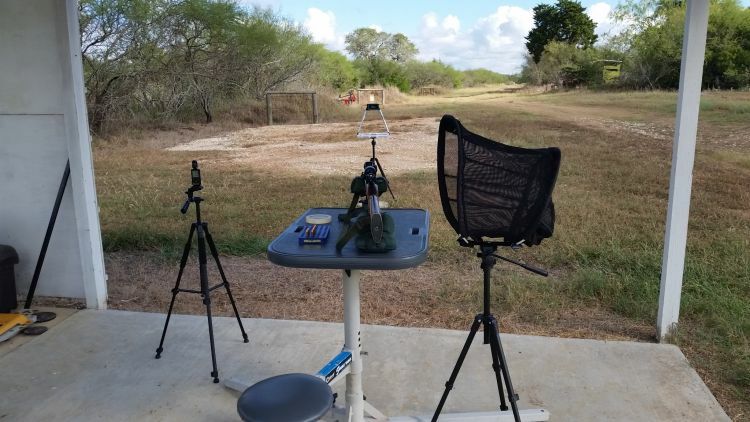 On a solid tripod, it does not wiggle in the breeze we have here in South Texas. It's inverted design is smart, with the screens on the bottom they are always reflecting light up to the device, so the lighting was not needed. I guess I would have to say that I've become a Caldwell nerd. Stable table, brass catcher, Chrony G2, wind meter, and target cam. Target cam is not shown as I was shooting the 30 Carbine at 50 yards. The cost of all that is what I have into the Labradar:? Anyway, the Universal 30 Carbine liked the PPU 110-grain soft points with Lil-Gun. Will be over on Grafs in a bit for more of them. I will also go ahead and finish up the Hornady bullets. I did all the incremental work with the PPU on the Load-Master. I always thought a progressive press not suited for this work, but I was wrong. I do have to do some more filing on the bullet feeder die port. It is just a bit short for the length of the PPU. I switched my Win M94 from cast to the Speer 180-grain HCFP. Right inside the muzzle, there are some tooling marks from the rebore, and I think that is what the cast bullets are not liking. I had thought about lapping the barrel, but I don't want to open it up any. I thought I would send a hundred bullets out the barrel over the coming year to see if that can settle things down before revisiting cast. The rifle and cartridge love the Speer bullet. Great shooter! Next up was my Sav 10FCM Scout chambered in 7.62x39 with the Speer .308 150-grain HCSP. Ooow... the rifle likes the bullet. It is spitting them down range at 2400 FPS and is an MOA shooter. It goes on the Collet die next and will see if it becomes a sub-MOA shooter. This rifle would probably fit all my hunting needs here in Texas. Yep, it was a great morning!